PLUCK (USA) (Bay 2008-Stud 2012). 3 wins at 2, US$727,290, Breeders' Cup Juvenile Turf S., Gr.2, Woodbine Summer S., Gr.3, 4th Monmouth Continental Mile S., L. Half-brother to SW Three Hearts (Del Mar Red Carpet H., Gr.3). Out of SW Secret Heart, a half-sister to SW Covenant (Kenilworth Majorca S., Gr.1) and SW Promisefrommyheart (Greyville South African Fillies’ Guineas, Gr.1). Sire of SP Gasoline and of Cogliere, Aussie Austin and of the placegetters Metazoa, Pampierstad, etc. His oldest progeny are 2YOs. STARTLING, by Mossman. Unplaced. This is her second foal. Her first foal is a 2YO. Oompa Loompa - Happy Bao Bei (H.K.). 7 wins at 1200m, 1300m, A$237,360, HK$1,309,100, to 2014-15, ATC Berkeley Hotel H., Narellan Town Centre H., Power Access H., Become an ATC Sponsor H., HKJC Sauternes Cup, Hoi Lai H., 2d ATC Freshworld H.
Barbaresco - Jungle Prince (Mac.). 2 wins at 1500m in 2014-15 in Macau, 3d MRC (Mornington) Window Warehouse P.
Bodalay. Winner at 1200m in 2015-16 in Aust. YOUSINGWEDANCE (Danasinga). 3 wins at 1600m, 1700m to 2015 in Malaysia, Penang TC Dr Lim Ah Soo Memorial Trophy, L.
Lindalay. 6 wins. See above. Con's Gold. 4 wins to 1350m to 2014-15, SAJC Moet & Chandon H., 2d SAJC Taylor Collison Stockbroker H., Schweppes SA Sprint Series H., 3d SAJC Leader Computers H., Medallion Homes H.
Stylish Attack. 3 wins at 1600m in 2015-16, Avondale JC West Brook Winery H., 3d Waikato RC Welcome to Penang Turf Club H.
New Empire. 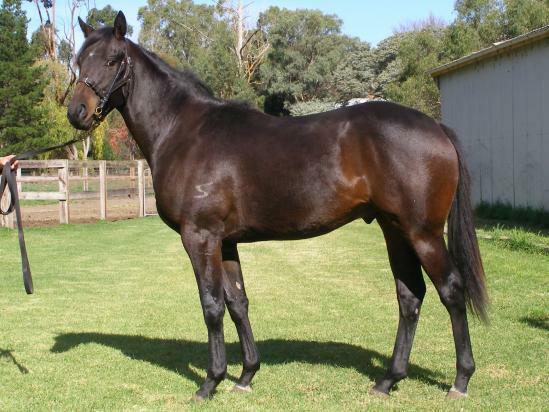 6 wins from 1200m to 1900m, A$77,615, to 2014-15, 3d SAJC Angelakis Bros H.
Exciteanation. 2 wins at 1000m, 1200m to 2015-16 in Aust. Bold Moment (Fasliyev). 2 wins at 1000m, 1200m, A$96,250, VRC Flemington Festival of Racing H., 2d MVRC Timbercorp P., MRC Blue Diamond Entries 2YO H., 3d VRC Red Roses S., L, MRC Twilight Glow S., L. Producer. VEE FOR VICTORY (Victory Dance). 6 wins from 1200m to 1600m, Rotorua S., L, Avondale JC Winter Cup, American International Group H., 2d Marton JC Metric Mile, Gr.3. Producer. COME ON LADY (Comeram). 3 wins. See above. STOCKWELL LASS (Arch Sculptor). 2 wins at 2, VRC Maribyrnong Trial S., L, SAJC Fincastle S., 2d VATC Blue Diamond Prelude, L, Wiggle H. Producer. BESERK (Bonhomie). 5 wins from 1200m to 2550m, A$94,240, SAJC Veuve Clicquot S., L, VRC Mobiletronics H.
SILKY DANCER (Citidancer). 5 wins-1 at 2-at 1400m, 1600m, R282,450, Clairwood Tibouchina S., Gr.3, 2d Kenilworth Cape Fillies Guineas, Gr.1, Greyville Flamboyant S., L, 3d Clairwood Golden Slipper, Gr.2. Producer.